For most business and one-man shops, the brand and image your project is invaluable to your operation. Having a consistent image is one tip that you’ll here over and over again about your brand. Consistent branding and image through the use of graphics, colors and fonts helps boost your image of professionalism and says that your not just simply a fly-by-night, anything goes, chop-shop. 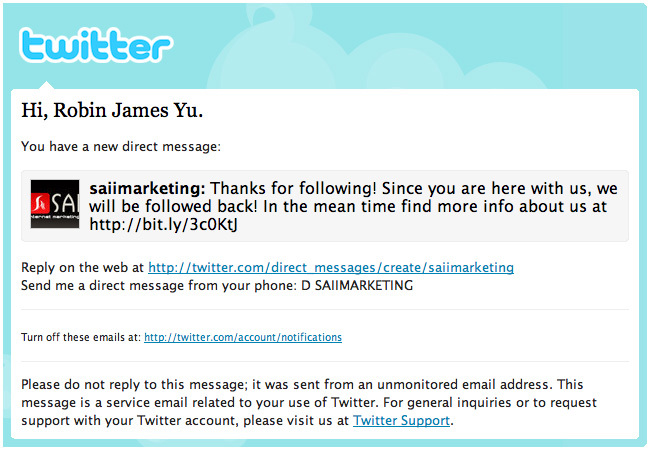 Take the Twitter message alerts via HTML e-mails as an example. They use the same colors, fonts, graphics and layout scheme that you’ll find on a typical twitter website. This helps build recognition to their brand as well as looking professional. 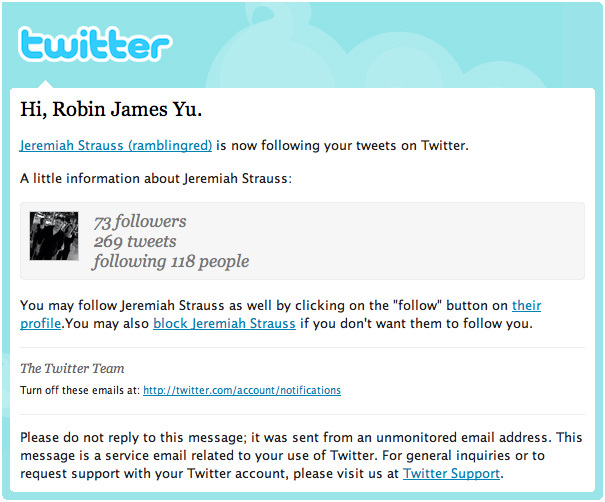 When I see the e-mail I instantly recognize it as coming from Twitter and design cues help me remember the type of branding and image Twitter stands for. Both notify you of important events in your social networks. The difference is that Facebook’s is simply a plain message while Twitter’s is HTML powered. With the Facebook e-mail, it’s hard to initially discover what’s important and what’s not. There’s a lot of links, a lot of text that’s all jumbled together in a plain environment. With the Twitter HTML powered e-mail, we instantly recognize what the most important piece of text is within the e-mail through font-sizes and font-weights. We also are able to quickly recognize who sent the message via an image. Through the layout, we are able to determine what information we can safely ignore such as those undersized elements and those at the footer. I’m sure there are more reasons why HTML powered e-mails are important but these are two of the more important ones that made me decide to use them in my own freelance business. In my next post, I’ll discuss how to design and develop your own HTML powered e-mails and show you some of the ones I use for my freelance business. What do you think about the importance of HTML powered e-mails for any type of business? Emails in HTML are nice but sometimes viewing them on a mobile device or plain-text client can be troublesome. 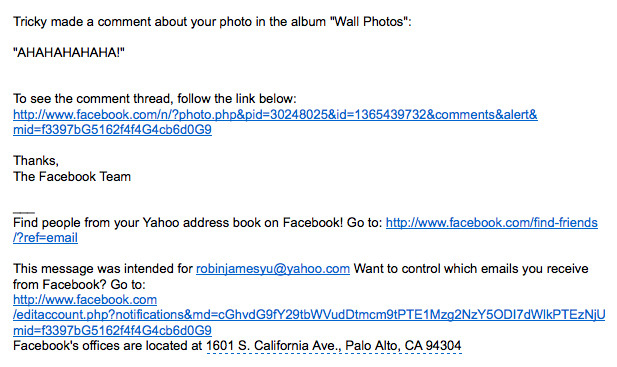 I think it’s best to at least have a plain-text email, and if you want, complement it with an HTML version. This way, non-HTML enabled clients have something to read aside from HTML code. If not, there’s always the option for people to choose whether or not they like their email in HTML. Sometimes, there are times when there are just too much HTML involved that it’s difficult to for the recipients to reply to or forward emails because of formatting. This is precisely the reason why I personally prefer traditional emails over their “enhanced” version [I think both are HTML, but the latter is formatted with two columns.]. I guess what I’m saying that it’s also important to factor in the the end-user/recipient — so overall, it would be readability, usability and the intent of the email. Yep good point Loki. You are very correct that plain e-mails are absolutely essential before you even think of making an HTML one due to the uncertainty of the destination user’s client, I’ll discuss that in the next article and how easy it is to do this. This another reason beneficial quality photo storage boxes are crucial in protecting your notable prints.